Powered by efficient 3 or 4 cylinder FARMotion engines with class-beating performance and specific fuel consumption (with the most powerful variant delivering 113 HP at just 2200 rpm), CVT models feature a new continuously variable transmission developed specifically by SAME for this application, and an even more comfortable cab than ever with the all-new MaxCom armrest, a control console offering unparalleled levels of ergonomics and comfort for a specialised tractor. The MaxCom armrest lets the driver configure all the functions controllable from the joystick precisely as needed, for operating even the most complex implements simply, comfortably and intuitively. 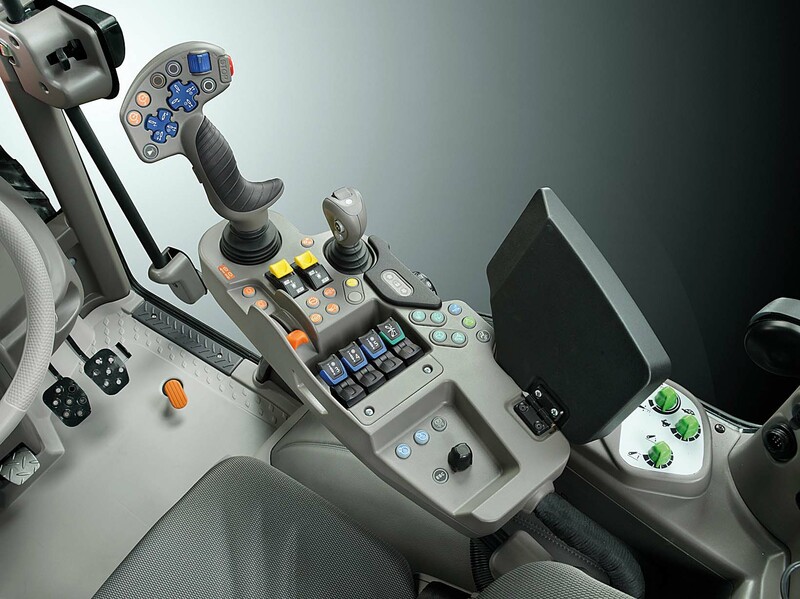 The MaxCom controller equipping Frutteto CVT S tractors is a concentrated package of high technology derived from premium tractors developed specifically for the smaller interior space of a specialised tractor. The result is a multifunction armrest measuring just 20 cm in width, that offers the driver access to a comprehensive choice of functions in complete comfort. Integrated into the driver seat and longitudinally adjustable to suit the stature of the user, ensures fingertip control of all functions while seated correctly with the forearm resting on a comfortable, padded cushion. The ergonomic “fingertip” levers, arranged in a row, are usable to control supplementary distributors and the front and rear lifts. All the controls are organised rationally for unrivalled ergonomics, with extensive usage of the tried and tested, intuitive colour coded scheme developed by SAME. The new continuously variable transmission equipping SAME Frutteto CVT S tractors combines the efficiency typical of a mechanical system with the comfort and smoothness of a hydraulic system, for seamless speed control from 0 km/h all the way up to a top speed of 40 km/h – attainable at low engine speed for extraordinary fuel efficiency. Not only are there no clutch and no gears, many operations can even be performed without using the throttle or brakes to maintain the correct speed, by simply selecting and attaining the required speed with the throttle. The engine speed and transmission ratio are then matched automatically to ensure maximum efficiency in relation to load. Alternatively, the cruise function may be used to control the speed of the tractor: simply pressing a button to store a new work speed or recall a previously set work speed. A dedicated dial lets the operator select from a variety of different engine management modes ranging from “Eco”, which minimises fuel consumption, to “Power”, which maximises tractor performance. The new CVT transmission also features a groundspeed PTO mode. The hydraulic system also offers a comprehensive choice of options to cater for any possible application, even in the future. The most complete configuration features a 100 l/min load sensing main pump feeding the lift and distributors, whereas all variants include a 42 l/min separate pump delivering oil exclusively to the hydraulic steering unit, to ensure smooth, progressive steering action even with the engine at idle speed and independently of any other demand for hydraulic power. 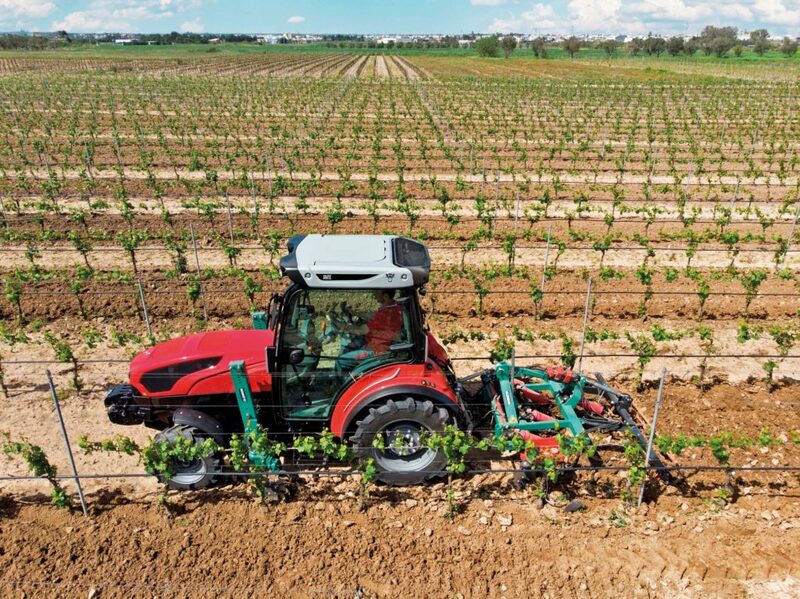 Up to five electrohydraulically controlled distributors are available at the rear of the tractor (for a total of ten ways), while another eight may be installed at the front. These may be supplemented by an additional two high flow rate front distributors (one double acting and one single acting), duplicated by two more rear couplers and two free return lines. 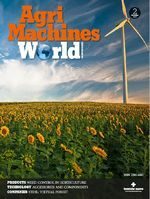 In all configurations, the electronic management system lets the operator programme the required oil flow, set timers for individual couplers and define priorities. The electronically controlled rear lift has a maximum capacity of 2,600 Kg, while the optional front lift has a capacity of 1,500 Kg. As standard, the PTO is equipped with a progressive electrohydraulic clutch and offers three different speed modes (540, 540 ECO and 1000 rpm). The Auto PTO function, which automatically engages and disengages the PTO in relation to the position of the implement hitched to the 3-point linkage, is also available as standard in all configurations. The layout of all engine accessories (radiators, fans, pipes, filters etc.) is designed together with the engine itself for compactness and intelligent space usage, but also to facilitate regular and unscheduled maintenance. Examples of this are the dual stage PowerCore air filter complete with dust ejector, and the new radiator pack (with the engine coolant and oil radiators and the intercooler), which is extremely quick and easy to clean, even when out in the field. The 85 litre fuel tank is large enough to keep even the higher performance model working uninterruptedly for many hours. Based on a new four-pillar structure, the cab of the Frutteto CVT S has been conceived to offer a spacious interior with compact external dimensions: the rounded edges of the structure give the cab a modern look with soft lines and slender pillars, maximising visibility while also minimising crop damage when negotiating narrow rows. As a result of the compact, low profile design of the CVT transmission, the cab structure no longer has to straddle the gearbox, allowing for a completely flat platform. The result is a spacious flat floor with not even a hint of a centre tunnel. The flat floor offers extremely easy access to the cab and an obstacle-free floor, with more room for the legs and feet and more closely spaced pedals, and also facilitates inspection of the hydraulic and electric components under theplatformitself. Also contributing to the significantly improved driver comfort are the new Hydro Silent-Blocks. The cab is suspended on these 4 special suspension mounts with integrated hydraulic fluid, which isolate the cab from the chassis of the tractor to maximise comfort by minimising the noise and vibration transmitted to the interior. A choice of specific mudguards for accommodating tall 28″ wheels or low 24″ is offered as an option, while the cab may also be requested with Class 4 homologation (certified officially in accordance with specific standards), providing effective protection for the operator when working with crop treatment products. The all-glass cab structure with a single piece windscreen and with no horizontal bar dividing the door glazing ensures an unobstructed forward view in all conditions, while the extended glazing in the roof offers a clear view of tall front implements which straddle rows. An air suspension seat and audio system are also available as options. In short, everything you need to work in complete comfort in an ergonomically correct driver position. The centre dashboard mounted onto the steering column is also completely new, and follows the reach and rake adjustment of the steering wheel so that the instruments are always in the ideal line of sight of the operator. The already generous standard equipment of the SAME Frutteto CVT S may be complemented with either a conventional swinging front axle or the new “Active Drive” hydropneumatic, independent front suspension system with active control. The latter option features a dedicated electronic control unit which continuously adjusts the spring and damping rate for each individual wheel, for a suspension system with extraordinarily effective dynamic behaviour that increases safety and comfort in all conditions and also ensures outstanding precision in mechanised canopy management. The Active Drive control software includes anti-dive and anti-roll functions as standard. Anti-dive improves stability and safety under braking by countering sudden front suspension compression, while anti-roll automatically adjusts suspension stiffness in relation to steering angle and speed to minimise roll. All versions feature electrohydraulically operated 100% lockable front and rear differentials for maximum traction in even the worst conditions.